Mets 2010 – Year of the No-Hitter? It’s well documented that only the Mets, Rays, and Padres haven’t had a no-hitter in their histories. When I started searching the Internet for facts and figures on futility, I came across someone that has a Mets blog about the elusive no-hitter. The Mets are up to 7,673 games without one now. And the Mets have had 33 one-hitters over the years including the famous July 4, 1972 no-hitter that Tom Seaver lost with one out in the ninth against the Padres. You can see the complete list of one-hitters in Mets history. Author Dave DoylePosted on May 8, 2010 Categories PitchingTags Johan Santana, Mike Pelfrey, Nolan Ryan, Oliver Perez, Tom SeaverLeave a comment on Mets 2010 – Year of the No-Hitter? Demolishing Shea Stadium and building Citi Field was certainly unwelcome for some Mets fans. It marked a changing of the guard for the franchise and maybe even a sense for some of us that we would be left behind in history as fans of the “old” Mets that played at the “old” stadium. But I have to admit that before this season, I was really looking forward to going to Citi Field. There would be no other way to open Citi Field than to have Tom Seaver throw out the first ceremonial pitch to Mike Piazza. Two of the Mets biggest superstars are the only former players that make sense. 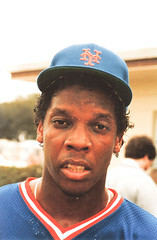 Sure, Doc Gooden could do it but he had an acrimonious parting with the Mets in 1995. That acrimony is only beginning to subside with his appearance at the Shea Stadium final game last September. There will be a game tonight at Citi Field. Its somewhat anticlimactic that the opening game in the history of the stadium will come against the lowly San Diego Padres. The scheduling gurus at MLB certainly didn’t do the Mets any favors with this pairing. Why would they pick a team from the west coast with no real ties to the Mets? At least they could have chosen the Los Angeles Dodgers to open Citi Field. The stadium is pratically a shrine to the Dodgers as it is. Of all of the strange things that Fred Wilpon has done, and there are many things you can criticize him about, choosing Tom Seaver and Mike Piazza to throw out the first pitch was the right thing to do.